The White House announced on Monday that former Army Capt. 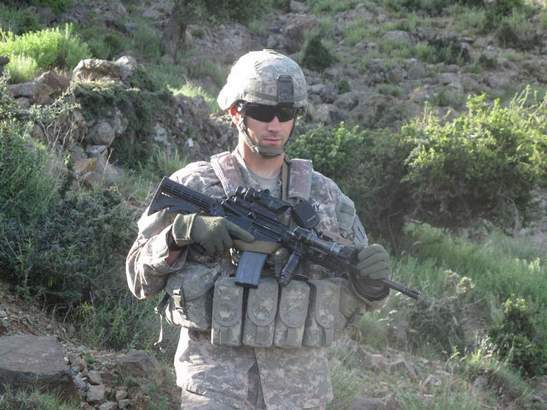 Will Swenson will receive the Medal of Honor on Oct. 15, four years after he braved enemy fire repeatedly while leading U.S. forces through a horrific ambush that erupted in eastern Afghanistan. CBS’s presentation of it is good, but touches on only parts of the raw emotion that is intertwined with the battle. It will be interesting to see what else emerges between now and Swenson’s ceremony at the White House next month. The same place we always have; down range and to your left and right. A long overdue and more than well deserved recognition for Captain Swenson. The Valley was full of true heroes that day with Capt. Swenson and Sgt. Meyer leading the pack in the finest American fashion. CPT Swenson, a true warrior. Very gratifying to see him finally recognized his actions at Ganjgal. I wish him a long, happy life. We salute you sir and thank you. This award is LONG overdue. Well done, Sir, and bless you. This video is additional conformation to my original suspicion this “battle” needs an in-depth independent investigation. We have eight soldiers who are the sole witnesses for two Medals of Honor, one Distinguished Service Cross and numerous Silver Stars. This reeks of a medals exchange and hyped highly-exaggerated combat action. Reading the citations for both Medals of Honor, both men are given credit for doing the SAME thing. Recovering dead soldiers while under fire is stupid and very poor leadership; calling in artillery on a civilian village filled with women and children is something Lieutenant Calley would have done. Swenson has been given credit for recovering the four dead while under fire and evacuating the wounded under fire—the video PROVES they were NOT under fire evacuating the wounded sergeant (the only reported wounded.) Look at the soldiers in the BACKGROUND. They are standing in a group talking to each other. Look at the faces of Swenson and the medic—there is NO urgency and no stress that occurs when you are UNDER fire from an enemy. The video CONFIRMS what the civilian reporter initially stated—the rescue of the 20 Afgan soldiers took place AFTER the gunships ran off the Taliban and the recovering of the 4 dead soldiers and evacuation of the wounded took place AFTER the Taliban were run off. Everything is in doubt or at best highly questionable. Even it being an ambush is questionable. What seems to have happened is they entered a village filled with Taliban fighters and the first four soldiers were taken by surprise and killed. The Taliban escaped into the mountains and used a rear guard action to slow down pursuit. This whole battle and all the awards need to be reviewed by an independent investigation team composed of the Marine Corps and the Army. Truly an act of both bravery and compassion. America’s sons and daughters should never cease to amaze us. That kiss on the forehead showed me that warriors become each others siblings, parents, children, and quite frankly they become more of a family than most of us will ever know. God bless them all. 1. One or two videos, less than five minutes long, does not provide one with enough information to accurately judge the intensity or length of the subject firefight, who was involved, their actions, etc. Was this filmed during the time that Sgt Meyer, CPT Swenson and others were working to aid their brothers, or after? Where was the LZ in relation to where the firefight took place? Why were the helicopter crews firing if the Taliban was already gone? The videos appear to confirm only part of what happened during a very small period of time in a very small area of the battlefield. You, on the other hand, read way too much into them and jump to unfounded conclusions to support your accusations. 2. The military does conduct independent investigations, especially when it comes to awarding Medals of Honor. It starts with witnesses filling out statements, lower-level awards boards reviewing the nominations, witness statements, and interviewing personnel they deem necessary. If the award nominations are endorsed, they go through several additional levels of vetting where due diligence is also exercised. This is usually the reason that the time between the actually event and the presentation of the award can often be measured in years. I fail to see how one more investigation made up of Marines and soldiers (as you suggest) similar to those serving on previous reviews would come to a different conclusion. 3. Marines and soldiers each act differently when exposed to combat. Some are easily stressed, some can remain relatively calm, and some can stand in a small group and shoot the breeze when not in the immediate environment of a firefight (perhaps near an LZ). Just because someone appears relaxed does not mean that they weren’t going through hell just a few minutes earlier. Leaders can often be very stressed inside, but some have learned to that it is better to appear calm and in-charge in front of their men (especially around the wounded). 4. Don’t blame the sergeant or the captain for the award nominations and witness statements that were submitted on their behalf. You and I probably submitted many award nominations without ever asking the nominees to review them beforehand. 5. Army helicopter pilots, with unobstructed views and nothing to gain by lying, have subsequently spoken to the veracity of the firefight and the heroism they observed during what unfortunately became a recovery operation. I’ll take their word over yours. 6. So, was the village full of Taliban (as your last paragraph states), or was if full of women and children (as your second paragraph states)? Which village were they attempting to target with artillery? Let me guess, the Taliban conducted the ambush, then they ran out of town and ordered that the town be filled with women and children. 7. You apparently knew that the Marines whose bodies were eventually recovered were dead before Sgt Meyer, CPT Swenson and others undertook their actions. How did you know that? How did you know there weren’t one or two alive and their radio didn’t just stop working? What would you do upon hearing Marines make distressed radio transmissions, followed by no transmissions? Would you naturally assume that they are dead, and then wait for the enemy to leave before acting; or would you assemble a quick reaction force, air support, artillery support, etc in an attempt to come to the aid of your brothers? I know what I have done in those situations, and would do again, every time. I could go on all day. A cogent and lucid statement of your argument is what I expected from a Major, but what I read was a rumor-, innuendo-, and conjecture-filled rant. Yea, What Cliff said x 10. On behalf of United States Marine Corporal Jason Dunham, Medal of Honor Chapter #1156 of the Marine Corps League we SALUTE and thank you for everything you did that fateful day so far away from our safety here in America. We have waited YEARS for this to be announced and are thrilled a man of your caliber joins the ranks of Medal of Honor hero’s our country cherishes. Thank you for serving and being a real leader and inspiration to our children. We have nothing but the HIGHEST respect and admiration for you. May God bless you and your entire family. Donald: There’s one word (actally, two, but I won’t use the first) to describe you: Clueless. Hats off to a warrior. That’s why we serve for love of country and each other. Please Donald E. Zlotnik, Major (RET), don’t piss on US PSYOPs operations, they are good for national morale ! We’ll get more recruits to feed the machine! MAJ (R) Zlotnik, maybe there is a reason you retired as a Major, maybe not. I would love to hear your facts on this battle. Until then please keep your comments to yourself. I find it interesting that more and more people think that our awards system is broken rather than think that our military personnel are capable of such great acts of valor. I for one am in the second category. Congratulations to CPT Swenson. Donald E. Zlotnik, Major (RET), I am so glad you are retired and not in command of my son, who is fighting there in Afghanistan right now. It’s not too late to learn how to positively encourage people and be grateful for heroes. PLEASE keep your negative comments to yourself. Didn’t your parents ever teach you that “if you can’t say anything nice, don’t say anything at all” ? You only look like you are jealous that you didn’t receive this honor! Shame on you. Most of us are so thankful for Capt. Will Swensen and are glad you are finally recogized for all you did for our country. Donald E. Zlotnik, Major (RET), are you jealous that you did not receive this honor? I am glad that you are not in command of my son who is currently serving in Afghanistan. Stay retired. We don’t want you in command of anyone. Thank you Cpt. Swensen. We are so proud of you. Major Zlotnik, you are an idiot and a disgrace. Shut your c*ck holster now. Its pretty obvious why you retired as a Major. The story of Operation Red Wings is about a Seal Team. All except one were killed and Lt. (SEAL) Michael P. Murphy was later awarded the Medal of Honor (MOH) posthumously. I came to the conclusion long ago there was more than one witness to this entire battle. Which is required for the MOH. The Battle of Ganjgal likely had the same witness. Drone(s). I believe both of these battles were entirely recorded on video. The video has been seen by a select few to meet the requirements for the MOH and is locked away somewhere and not likely to be released for at least 35 to 50 years. In the meantime, I’m satisfied Captain Swenson has earned this medal. Just my opinion. Captain Swenson…..Watching this moving video clip has touched me deeply. You have given me renewed faith in my fellow man! I thank you and your comrades for your heroic efforts which afford each of us such great freedom. It is men like yourself that make proud to be an American! WTF MAJ (RET)??? I’m glad you “retired” (if you were ever actually in the military to begin with). — Napoleon Bonaparte — the “Father” of the modern-day “Military Awards system” …. I meant to add my congrats to CPT Swenson as well … while four years is a long time to wait — let’s get it right the first time. As far as Slotnik goes, you weren’t there as others have stated, you are most likely taking a 5 minute video out of context and so, in the end, please shut up …. !! PS — Does anyone know Swenson’s unit …?? В русской армии за такую эвакуацию оторвали бы яйца. Что делал этот капитан у вертушки? Переживал? Его дело – руководить боем, если кругом стреляют. Тащили трупы долго, еле шевелились. А вот летчики молодцы – заход на 5 баллов! Desires? I have NEVER heard a MOH recipient say “YES! Finally got that MOH! Look at me!”..
No, most heroes don’t want the recognition and usually only accept it on behalf of their fallen friends. They usually explain that they did nothing that was extra ordinary and that what they did is what anyone would do for their brothers. The MOH isn’t won or desired. It is earned.. It is bestowed.. It’s not a competition to see who can get one.. It’s usually accepted most humbly by men who would trade it instantly to have their buddies, or their own lives back. Yet another rant about other operators where you get summarily owned in the comments section. I commend you for your service and can sympathize when good men don’t get the recognition they deserve. However, pulling others down does nothing to elevate you or the men you think are more deserving. Thank you, Cliff. Well said. Thank you CPT Swenson. Well done. I can only imagine the character or service record of a retired Major to judge the entire action on a partial video clip of an LZ. Glad I was never under his command. Outstanding! Thank you Sir 🙂 there are good men.